Please refer to our stock # kjl1 when inquiring. These charming vintage pins were made by legendary costume jeweler, Kenneth Jay Lane. Each bug pin is 1 3/4" long x 1 5/8" and both are made from gold plated metal with pave crystal accents. 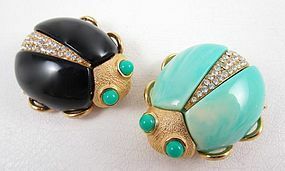 The wings are made from black and turquoise resin that resembles bakelite. They are in excellent condition and are signed "Kenneth Lane" on the reverse. They are priced individually at $125 each.